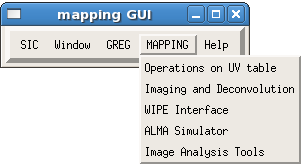 MAPPING is the GILDAS software package to image and analyze NOEMA data. The tools described here are complex procedures built over simple MAPPING commands. We recommend to look at the MAPPING manual to have a deeper understanding of imaging and deconvolution concepts and of the command functionalities. The menu shown in Fig. leads to two main sections, Operations on UV-tables and Imaging and deconvolution. In the widgets resulting from the selection of these options (Figs. and ) the left column lists the procedures to be run, their control parameters can be edited by clicking on the related button in the central column, help is displayed by pushing on the right buttons. At the bottom of all the ``Parameters'' widgets (see e.g. Fig. and ) there are the options GO and DISMISS. GO executes the procedure with the specified parameters, DISMISS closes the widget. In the below sections, the paragraphs starting with At the prompt: describe how to run the same procedures through the command line instead of through the widgets. While this possibility exists for all the widget functionalities, information is given for some of them. In general, typing``go procedure_name'' is needed to call MAPPING procedures. To modify the control parameters ``let variable_name value'' is used. Their content can be checked with ``input procedure_name'' or by typing ``exam variable_name''. The name and a short description of the control variables can be found by clicking where the values for parameters are requested, in the widgets. In addition, a few variables are used by (almost) all the procedures. You can also define their values directly at the prompt. For instance ``let name ...'' is used to define the generic name (without extension) of your table or image, ``let first ...'' to define the first channel to be considered, ``let last ...'' to define the last one.